From one half of the creative team that brought you Dumb and Dumber To, My Myself & Irene, Shallow Hal, and Stuck On You comes… one of the hottest Oscar contenders of the season??? Peter Farrelly, of Farrelly Brother fame, is going solo and abandoning his gross out roots to make a film that is getting serious buzz. How would that turn out? In the Jim Crow era of the early 1960s, famed pianist Dr Don Shirley endeavors to change hearts and minds by performing in concert tours of the Deep South. Despite his global acclaim, he is still an African American in a part of the world were segregation is still official policy and heavily enforced. To ensure his safety, Shirley hires well regarded club bouncer Tony Vallelonga to be his driver, bodyguard, and fixer. Despite coming from very different worlds, the two must coexist while on the road or in the car together for two months under unique and trying circumstances. There are two Oscar worthy performances on display. The film itself is getting good buzz, but the lion share of attention is for the performances of the two leads. This is incredibly well deserved, as the pair deliver very different performances that make the movie special. Viggo Mortensen (Fellowship of the Rings) chews the scenery…in a fantastic way… as the larger than life Tony Lip. He’s a goomba at heart but with an incredible capacity for emotional range. 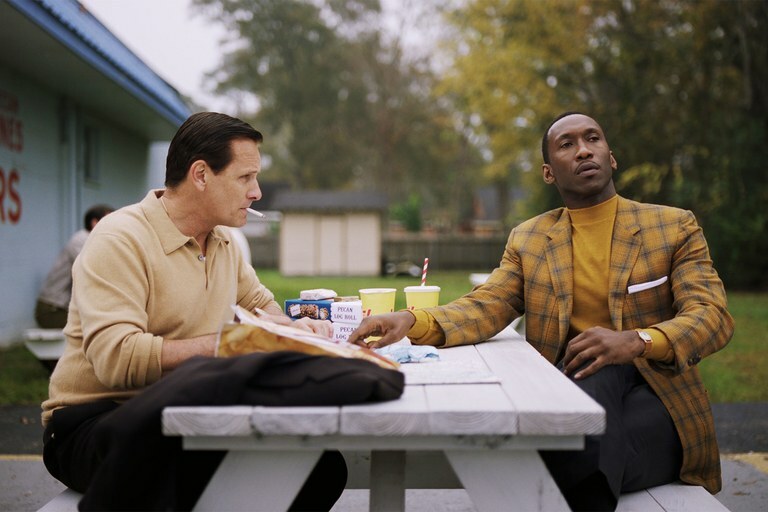 As good as Mortensen is, Oscar winner Mahershala Ali (Moonlight) is operating on another level altogether. He is so dry and stoic as the educated, above it all Shirley, but not in a way that prevents him from being in the moment. That is a very tricky feat to balance and Ali proves why he deserved his first Oscar and likely should add a second to his mantle. The chemistry between the leads was noteworthy. The pair is great as individual characters, but the film comes alive in their interactions. The odd couple plus fish out of water scenario provides fertile ground for comedy and drama; and the pair delights in both settings with their onscreen rapport. The movie is simply charming. Even amidst the horrible environment of Jim Crow south and the toll it took on black Americans, the film has a wonderful spirit that cannot be denied. It’s a movie that covers a shameful time in our history, but still manages to be uplifting and inspirational. The conflict and resolution is at times simplistic. Tied to the uplifting nature of the film exists a little too “Disney”, lower complexity at moments that should be more painful. Shirley’s family noted this in an interview and I see their point. Because we are always moving on to the next victory over oppression because of Tony and Don’s perseverance, you fail to see how African Americans without wealth, fame, and connections would have been treated. Too many of the brightest moments were spoiled by the trailer. This is always a risk, but there are some CRITICAL moments of the film played out right there in the trailer. I normally don’t notice this but the producers went deep to sell this movie to audiences. It’s a shame. There are a couple of those amazing scenes I would have liked to have seen first in the theater. What a wonderful film. The performances and dialogue are simply first rate. I’m still smiling a day after seeing it. I think the only thing that keeps it from getting a 10 is Farrelly didn’t know when to turn off the whimsey and let the audiences stew a bit in our discomfort. Overall, I give Green Book a score of 9.5 “Assisted Letters“ out of 10.